As anyone who has had a complex or stubborn skin condition, sometimes it’s just not as simple as using a daily cleansing face wash to treat blemishes and problem areas. For acne sufferers past and present, those with enlarged pores, and those with fine lines and wrinkles, skincare means serious business. If you’re currently experiencing any of the above, could microneedling be the answer you’re looking for? In fact, could microneedling be your skin’s saviour? Microneedling is a treatment used to rejuvenate the skin when it is tired, ageing, or otherwise damaged. It involves a handheld device that houses very fine needles that pierce the skin to a controlled and safe depth. These tiny needles create tiny holes in the skin, and this is when the magic happens. Microneedling helps acne scarring through the healing it instigates in the skin. There are two main types of acne scarring that microneedling helps to treat: pitted acne scarring, and post-inflammatory hyperpigmentation (or PIH). Pitted acne scars form because of a particularly aggressive bout of acne that has damaged essential skin fibres like collagen. Because these fibres are what knit the skin together and keep it firm, when the skin heals without the necessary amount it can form these kinds of skin depressions. Thus, pitted acne scars are made. Microneedling helps with pitted acne scarring by creating controlled wounding in the skin, stimulating the production of fresh collagen and skin cells from the inside-out. This helps to relevel the skin, smoothing acne scarring by healing them and replacing the collagen from beneath the surface of the skin. Post-inflammatory hyperpigmentation occurs when an area of skin is damaged or compromised and therefore becomes inflamed. This inflammation causes irregular pigmentation when healing, leading to red, pink, brown, or sometimes purple splotches in the skin where past blemishes have healed. Microneedling damages the top layer of tissue, forcing a new skin cells turnover to take its place and therefore create a more even skin tone. Enlarged pores can occur after a bout of acne, in congested or breakout-prone skin, or simply because your skin is a little on the oily side. Enlarged pores can occur because they’ve been ‘stretched’ by oily spots and blemishes that have formed under the skin and come to a head in the surface that is bigger than the pore. This stretches it out of shape, causing them to become more visible than they would naturally. 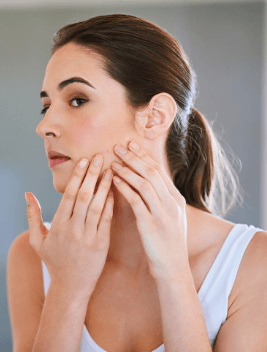 Enlarged pores can also occur if you’ve picked at your spots or blemishes, because they won’t have had an uninterrupted or natural chance to heal properly. Microneedling helps to address large pores by stimulating skin cell and collagen production within the skin while damaging the top layer. The top layer of skin cells is encouraged to be shed because of the damage the needles cause, while the stimulation of collagen and cell production beneath works to replace those lost. The result is less visible pores and a more even complexion. Through the natural ageing process, we lose the collagen levels in our skin. This leads to it becoming gradually thinner, lacking in structure, and therefore folding on itself to create fine lines and wrinkles. Microneedling pierces the skin with tiny needles which force it to regenerate from beneath the surface, which in turn brings about collagen production. This internal production of collagen that would otherwise be dormant helps to firm and add structure to the skin, relevelling wrinkles and fine lines. Plus, because these needles open columns in your skin that don’t fully close for a few days post-treatment, you might find that your topical moisturisers and serums penetrate deeper into your skin’s layers. Microneedling is an incredibly popular treatment and extremely versatile. It isn’t just reserved for skin complaints, it can simply be used to add a fresh-faced glow to tired or dull skin that is in need of some vitality. Discover how microneedling could become your skin’s saviour with Omniya, our prestigious skin clinic in Chelsea. Enquire online or speak to a member of the team on 020 7584 4777 to book your free skin treatments consultation today!